Bhakti Yoga is the spiritual discipline for this era. This yoga uses the power of our feelings and emotions to lead us to God. It is the most natural spiritual practice and is best suited for most people. 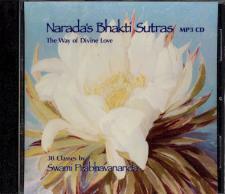 This scripture is also known as the Narada Bhakti Sutras. Taught by Swami Prabhavananda from 1961-1962, these classes have a lively feel of enthusiasm and conviction that will make the talks a classic for years to come. Learn how your emotions and feelings will lead you to God without contradicting the mind. All classes are copyright Vedanta Society of So. California. Sales of these classes supports our preservation work. Thank you for not duplicating our recordings. Please note that most of the classes are compressed into a zip file. You will need a utility to unzip the file if you don't have one. Here is a link for one ZIP reader.